At the offices of Merrick L. Horn, we diagnose and treat Aventura flat feet in children that need foot care. 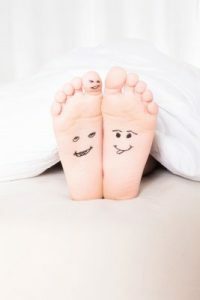 Our podiatrist handles all aspects of heel pain, and flat feet can be found in both infants and toddlers when the foot’s arch does not grow properly. Children may suffer from foot pain, ankle pain or pain in the lower leg. We may prescribe custom made shoe inserts for Aventura flat feet. Shoe inserts are a non-prescription foot support designed to be worn inside the shoe. They may be custom made and can also be found in store. But the prescription made custom shoe inserts are only designed by a doctor and crafted for each individual foot, called a custom orthotic device. Shoe inserts help ease flat feet and can support the foot arches but cannot correct some problems. Arch supports can help those with high arches, people with flat feet, and those with low arches. They bump up the shoe and support the foot’s natural arch and are very comfortable. We also provide patients with insoles, heel liners and foot cushions. Insoles go inside the shoe and provide extra support. Made of foam, gel or plastic, insoles can really help support the foot and keep the extremely comfortable. Heel liners provide extra cushion as well, and help patients who have problems when their feet rub up on their shoes. If you or your child suffer from Aventura flat feet, call our offices today to schedule an appointment today. We can diagnose your child’s flat feet before getting them into either an orthotic shoe or a customized treatment plan to help them get their feet feeling good and back to normal. You can even try on your custom made shoes to see how they feel on your feet before going home with them. This entry was posted in Uncategorized and tagged Aventura, flat feet, foot care, heel pain, podiatrist on October 26, 2016 by pjdhanoa.